Wild Turkey Diaphragm Calls. Includes 1 "Double D",1 "Raspy Old Hen" and 1 "Cutt'n 2.5" Small Frame-Youth diaphragm calls. Comes with free Diaphragm Stack Case. Wild Turkey Diaphragm Calls. 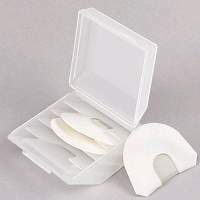 Includes 1 "Single D", 1 "Double D", and 1 "Split V II" Gold Premium Flex diaphragm calls. Comes with free Diaphragm Stack Case. "Cutt'n and Strutt'n 9, Volumes 1 & 2" DVD. The H.S. Pro Staff shares tips and tactics as they take on gobblers from across the country. 26 hunts. Includes free turkey track window decal. 2 DVDs. 3-1/2 hours. Ease of use and authentic tones and range are Palmer Hoot Tube's most attractive qualities. All Maple body. Endorsed and used by the Hunter's Specialties Pro Staff Team. Patent Pending. Palmer Grand National Champion Hoot Tube. Award-winning lexan gobbler locator. Deluxe Collapsible Two-Way Strut Seat. Aluminum turkey seat. Reversible angle for maximum comfort. Green OD finish with 2-inch webbing for seat support. Collapsible, lockable legs for easy carrying. Includes black web carrying strap. H.S. Strut embroidered four-color logo/turkey Baseball Cap in REALTREE HARDWOODS GREEN HD. Embroidered turkey tracks on back. One size fits all. H.S. Strut embroidered brown logo/turkey Baseball Cap in REALTREE HARDWOODS GREEN HD. Embroidered turkey tracks on back. One size fits all. H.S. Strut® embroidered four-color logo/turkey Baseball Cap in ADVANTAGE® TIMBER™. Embroidered turkey tracks on back. One size fits all. H.S. Strut® embroidered brown logo/turkey Baseball Cap in ADVANTAGE® TIMBER™. Embroidered turkey tracks on back. One size fits all. Take traditional craftsmanship with you as you head into the woods. This double-sided, "boat paddle" style call blends walnut and cherry surfaces to produce consistent natural tones. Competition and field proven. Chalk and instructions included. The Hammerin' Crow Call is an excellent gobbler locator call. The realistic choice of champions and easiest to blow crow call ever. 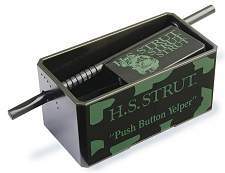 Adjustable reed, water resistant, tuned design. 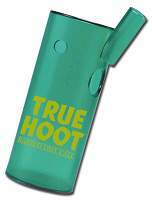 True Hoot Barred Owl Call. Authentic gobbler locator. Tone holes create multi tones. Locate gobblers like an expert with sound and volume that fire up big toms at a distance. Water resistant, lightweight and durable. The H.S. 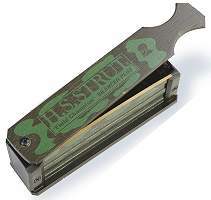 Strut Turkey Tube Call is easy to blow, and has a thin latex reed. Includes lanyard. The Song Dog® Coyote Call works great as a gobbler locator. Features interchangeable reeds, lengthened mouthpiece for range, two barrel extensions, an enlarged air channel and adaptable horn. 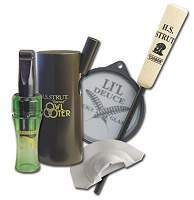 Super Strut Combo Kit. Includes Li'l Deuce Wild Turkey Call, Hammerin' Crow Call, Barred Owl Hooter and the "Double D" diaphragm call. 360 SL Friction Call Combo Kit with Surround Sound. 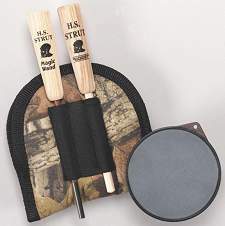 Includes 360 SL Wild Turkey Call, camo pouch, Magic Wand and hickory strikers. H.S. 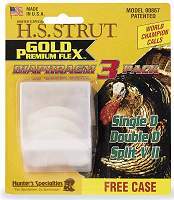 Strut U™ Mouth Calling 101 Video with 3 Premium Flex Diaphgragm Calls. Includes one "Single D", one "Double D" and one "Split V II" Gold Premium Flex™ diaphragm calls, diaphragm call case and 30-minute instructional video on how to use diaphragm calls. 360 SL Friction Call with Surround Sound. Slate surface and holes in the side of the pan allow the sound to travel 360 degrees. 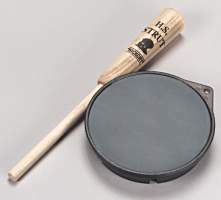 Includes hickory striker. Pro Staff Series. Patent pending. ADVANTAGE TIMBER camouflage accessories pouch. Includes belt loop and two elastic striker holders. Push Button Yelper Wild Turkey Box Call. Acrylic design. Calling made easy. Moisture-resistant camo finish. Champion Yelper Natural Wild Turkey Box Call. Natural color call produces all the sounds of the hen turkey. Single-sided. Natural wood sealed finish with laser engraving. Silencer Plus Field Champion Natural Wild Turkey Box Call. Natural color call produces hen and gobbler calls. Built-in lock restricts sound when walking. Natural wood sealed finish with laser engraving. Patented. Silencer Plus Field Champion Wild Turkey Box Call. Built-in lock totally restricts sound when walking. Produces hen and gobbler calls. Moisture-resistant camo finish. Patented. 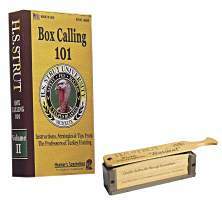 Gold Premium Li'l Strut Natural Wild Turkey Box Call. Pocket size, yet higher pitched. Built-in Silencer Plus lock totally restricts sound when walking. Produces two different hen calls. Natural wood sealed finish with laser engraving. Patented. Twister Gobble Call. Twist-on Silencer Plus restricts sound when walking. Patented.